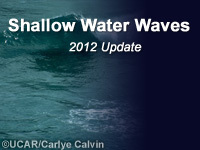 This is the fourth lesson in our series on open water waves. As deep-water waves approach the coastline, they encounter shallower water and begin to interact with the sea floor while evolving into shallow water waves. This lesson uses an interactive wave calculator to look at a variety of shallow-water wave behaviors, including shoaling, refraction, reflection, breaking, attenuation, and coastal run-up and set-up. All are important considerations when forecasting for small craft and other recreational interests in the near-shore environment. September, 2017: HTML and media assets in this lesson and the Shallow Water Waves calculator have been updated for current browsers and mobile devices. July, 2012: This module has been updated to provide greater flexibility in navigation and linking to specific content. In addition, minor changes have been made to improve the clarity of the content and correct inconsistencies. However, these changes do not affect the overall substance of the material taught.